BELOW THE BELT. By Stuart Woods. Read by Tony Roberts. Penguin Audio. 8 hours; 7 CDs. $35. Also available in hardcover from G.P. Putnam’s Sons. As anyone who’s tried the books knows, Stone is a wealthy man, with his private plane, servants and multiple houses in attractive places around the world. And nearly everyone he deals with is also excessively rich, and usually powerful as well. On one level, these books are pure fantasy for those who like to imagine how it would be to have more money than anyone could spend in a lifetime, to be able to hop from Manhattan to an English manor or a desert or island retreat at a whim, and find the chosen abode in perfect order and stocked with goodies. A good deal of dialogue deals with such things as wines, liquors and fine dining, not to mention yachts, cars and aircraft. When Stone needs a car, he buys a luxury one, and there’s no loan involved. This fantasy lifestyle also includes sophisticated sexual relationships. Stone always has a woman who’s intelligent, usually wealthy in her own right, and perfectly happy to engage in an adult relationship that need not have strings attached. It’s sort of like having a golfing or sailing buddy, only different, wink, wink. All this wealth, ease and dalliance are intriguing the first or second time, but the less successful books in the series offer little else. A whole novel in which people do little but jet around, buy expensive items, eat and drink well, fall into bed and then arise to do the same things the next day gets a bit boring. But Below the Belt will have you turning pages feverishly or, if you, as I did, listen to the audio version, taking the long way home to hear what’s happening next. This story begins at Stone’s new spread in Santa Fe, where he hopes to spend time with Holly Barker, a beautiful and willing companion who’s taking a little break from her high-level White House position. Things quickly get complicated after the former president, who happens to be the husband of the current one, asks Stone to do him the favor of taking possession of a strong case. What exactly the case contains and why various people are going to great lengths to acquire it are parts of a mystery that involves current and former intelligence operatives and could have bearing on the president’s re-election. The action moves across the country and eventually across the Atlantic, with danger and suspense mounting. A key player is a wealthy man who made his fame as a TV personality and who has been carefully groomed by an even wealthier man for a major political role that could profoundly change the United States. Could this celebrity politician have some explosive secrets in his past? If any of this sounds as though it’s loosely based on our recent election, that’s obviously the idea. But never fear, reading (or listening to) it is a lot more fun than living through recent events. As always, Tony Roberts does a good job of reading the audio version, and this time, the story is well worth his time and yours. 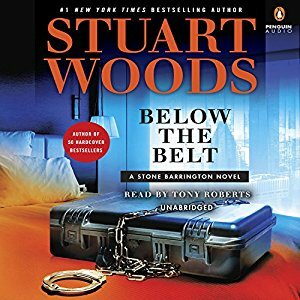 This entry was posted in Action/adventure, Audio Books, Popular fiction and tagged Audio Books, Stone Barrington, Stuart Woods. Bookmark the permalink.